Finding a good and reasonable restaurant in the first arrondissement near the Tuileries and Place Concorde can be tricky. There are either very upscale restaurants with serious atmosphere and expensive food or trendy watering holes with overpriced mediocre food. 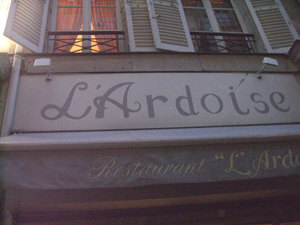 L’Ardoise is the perfect solution to my dilemma. Non- descript from the outside and nothing to look at in the inside, the excellent, well-executed food more than makes up for its plain Jane surroundings. The blackboard menu choices were many in each category and the description of each dish looked more appealing than then the next. Narrowing it down was a hard task but well worth the effort. I savored all the dishes since I rarely find a menu that I want one of everything on. Seafood was abundant, so I started with a tuna tartare with a wasabi & soy sauce. It was pungent, meaty the way fresh tuna should be, and perfectly sized to tide me over till my plat came. Continuing the seafood theme, I had Coquille St. Jacques for my plat. 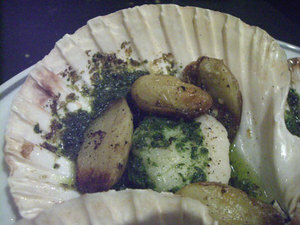 Cooked in butter ad herbs and presented in their shells along with teeny, tender roasted potatoes, this was the best Coquilles St. Jacques I’ve had in a long time. So often they are overcooked, rubbery, and saturated in too much butter. This was just the opposite: the texture was rich, chewy, and melted in your mouth. Dessert was a concoction (forgive me for forgetting the exact name) of strawberries in a glass with a gelatin- like substance underneath. 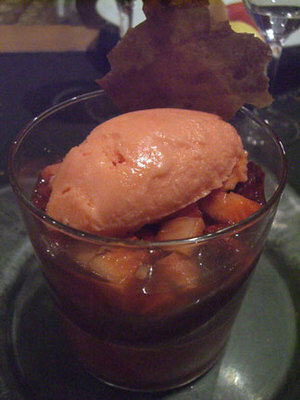 A scoop of homemade strawberry sorbet on top was just enough to make it a real and satisfying dessert rather than simple fruit. A medium-priced, hearty Bourgogne rounded out the meal. The restaurant was full with mostly Americans, which was curious because it seemed like the last place that would appeal to them. I asked a lively table from Atlanta how they found the place and one of them said they read about it in the New York Times. Bingo! They asked me where I was from and it was the perfect opportunity to shamelessly plug my tours and tout my blog, and I eagerly handed out my cards. The service was pleasant and professional and the staff was very patient in translating every dish into English. All this delicious and thoughtfully presented food was a bargain at 33 euros for three courses. Make sure you request sitting upstairs, as the downstairs smells too strong from disinfectant trying to disguise the damp odor. 28 rue du Mont Thabor, 1st arr. How nice that a restaurant called Blackboard has a blackboard menu!